Since it’s founding in 2007, the Battle Creek Metropolitan Mustache Society has raised more than $300,000 for local charities, individuals in need, and community projects. And it also has made a point of letting individuals know that they don’t need to grow facial hair or be of a certain gender to become a member. It was never really about the mustaches, says BCMAMS' founder Jeremy Andrews. There is no formal sponsorship process or initiation required to become a member. Essentially, anyone who shows up for general membership meetings which take place on the second Monday of every month at 7 p.m. at a local watering hole, such as the Lakeview Lounge, are considered members. Andrews says meetings average between 20 and 30 people, with about 200 participants throughout the year. The nonprofit organization eschews stringent rules and regulations because its leadership and membership think they have found a better way by emphasizing a fun factor in order to make good things happen in the community while making a real and impactful difference. “Our organization provides an outlet for our members where we can get together at least monthly to enjoy each other's company and discuss ways to help our community,” says Kyle Labrecque, immediate past President and at-large member. “We never take ourselves too seriously and require that our meetings and events be fun and even at times a little ridiculous. Labrecque, who is Andrews brother, says he got involved in 2009 after returning home from college. “I wanted to get involved as another way to hang out with our friends and do something positive for our community at the same time,” he says. The annual Festivus cardboard sled race and Leilapalooza music festival, both held at Leila Arboretum, are among two of the organization's largest and most successful events. Now both are in their 11 year. 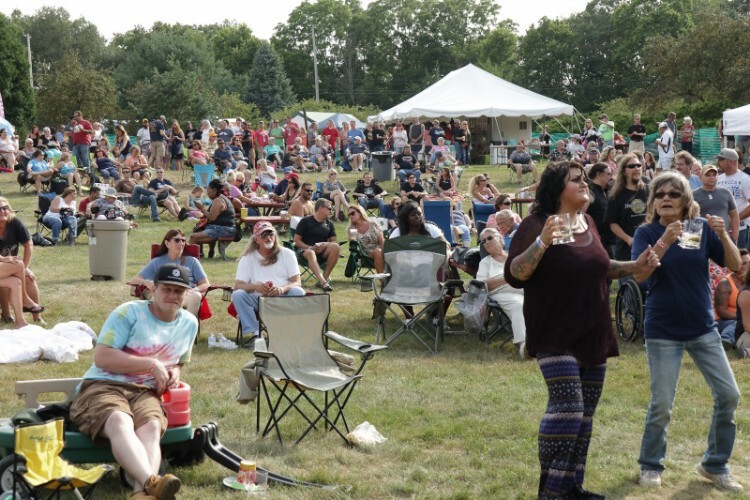 Festivus, held on Feb. 2, attracts more than 1,000 people and Leilapalooza, which takes place on the last Saturday in July, brings in more than 10,000 people. A raft race on the Kalamazoo River during the last Saturday in June has been attracting just under 1,000 people and is in the building stage. Andrews says the raft race is an homage to an event that had been done by the local Jaycees. These major events are among more than 80 that the BCMAMS have organized since its founding. Labrecque says one way to help a city thrive is to make as many attractive options available as possible for community residents to get involved in. Thousands gather to celebrate Leilapalooza.“If the current population has things to do and our younger population sees an attractive environment, then they may want to stick around or come back home after post-secondary education,” he says. In order for a charity to be considered to receive money from BCMAMS fundraisers, it must be willing to work with them on the event and provide volunteers. Unlike most nonprofits, nobody with the BCMAMS receives a paycheck for what they do or pays membership dues. Andrews says the organization’s total volunteer status creates the need for charities interested in working with them to be active partners in any event they will benefit from. “We only partner with people willing to work with us on the event,” he says. The decision on who they will partner with is based on a member vote taken after representatives with the nonprofit make a presentation to the group in attendance at a meeting. The fun factor that is at the core of everything the BCMAMS do is also part of this decision-making process. Labrecque says the thing he most loves about the organization is its ongoing ability to operate with a 100 percent volunteer staff, while also encouraging and welcoming people of all backgrounds and skill sets into the fold. In addition to events held to benefit other nonprofits, the BCMAMS hold one event strictly to generate funds to purchase necessities including equipment, tents or merchandise, and to set aside money for other events. “Our slogan has been ‘Changing the face of charity right under your noses',” Andrews says. “It’s all about getting new people involved in the community. These may be people who don’t think they can be involved in doing good in their community because they don’t have money to give.